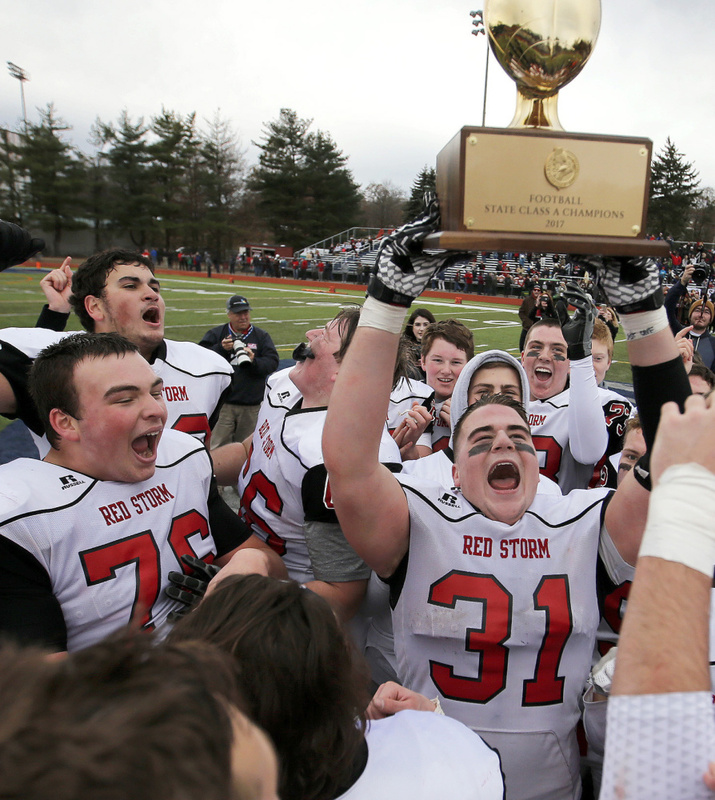 The senior running back rushed for five touchdowns in the championship game as the Red Storm won their first Class A title. To his coaches, Owen Garrard is a modest, unassuming and beloved leader who still bears hints of the self-described shy third grader who moved to Scarborough from Gorham. “He’s almost timid off the field, and even in practice he might go through a whole practice and not say 10 words,” said Scarborough High Coach Lance Johnson. 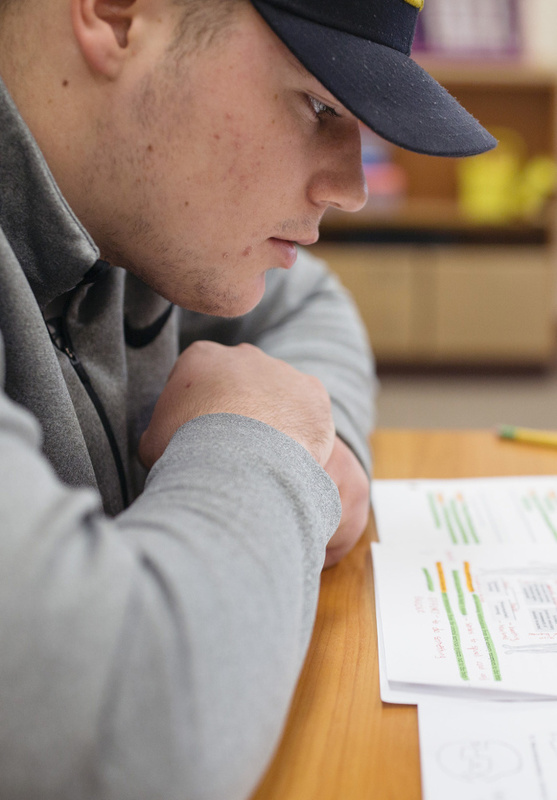 Scarborough high school senior Owen Garrard studies AP psychology during his academic enrichment and support time in teacher Sarah Blaisdell's classroom. Garrard has a weighted GPA of 96 and takes several honors and AP classes. His teammates, however, were always keenly aware of Garrard’s presence. In games it was common to hear them call out his simple nickname, O.G., in a rising crescendo as soon as he burst through a hole or after he had planted an opposing back. As a 6-foot, 225-pound running back who could side-step the first tackler and then often bowl over the next, Garrard rushed for 1,204 yards and 24 touchdowns, averaging 8.7 yards per carry. A three-year starter at linebacker, he hit with power, making 76 tackles this season – 10 for loss with two sacks. And, when Scarborough finished its 10-1 season with a 57-0 rout of Windham to win the school’s first Class A title, Garrard scored five touchdowns. “Owen was the best offensive player and the best defensive player in our league,” Johnson said of Garrard, the Maine Sunday Telegram’s Player of the Year for football. But to paint Garrard as only a football star would be an unfinished portrait. Taking a course load heavy on honors level classes (including calculus this term) with a few advanced placement courses sprinkled in, Garrard has a weighted grade-point average of 96.2. To teachers like Sarah Blaisdell, Garrard is a respectful, mannered and hard-working student who understands the value of preparation. “When I taught him last year in precalculus, he was willing to spend time out of class to make sure he knew the material,” said Blaisdell. “He and some of his friends would be here at 6:30 in the morning for extra help. Next year, Garrard will have to find a new balance. His on-field talent and strong academic work drew interest from college football recruiters, but Garrard made the decision early this fall to not play football after high school. “I just want to focus on academics. Football was a nine-month out of 12-month thing, and especially the way I run the ball, it was really taking a toll on my body, too,” Garrard said. Unsure where he’ll attend college, Garrard said he would like to pursue studies in criminal justice. He could see himself being a detective. He figures he’ll get his athletic fix by working out, and playing some intramural football and pickup basketball. Johnson has little doubt Garrard could have been an effective college running back, particularly at Division III. It was on a football field where Garrard said he made some of his first friends in a new town. Many of them stuck together, with more being added over the years, all the way to a championship ending. “It’s a great sport and you really don’t know the bond it creates until you play the game,” Garrard said. Zoltan Panyi, Scarborough senior quarterback: Led his team to the school’s first Class A championship. Scarborough scored more than 49 points per game, and Panyi completed 62.3 percent of his passes (63 of 101) for 1,444 yards and 19 touchdowns against three interceptions. He also rushed for 574 yards and seven touchdowns. Owen Garrard, Scarborough senior running back: Our Player of the Year was a dominant two-way player. As a power back he rushed for 1,204 yards and 24 touchdowns on 138 carries. He also became a devastating lead blocker on sweep plays. At linebacker he made 76 tackles, 10 for loss, with two sacks and one interception. Nolan Potter, Wells senior running back: The 6-foot-1, 210-pound Potter was the driving force behind Wells’ Class D title and unbeaten season. He rushed for 1,550 yards and 28 touchdowns. A starting linebacker as a junior when Wells won the Class C championship, Potter again starred on defense with over 100 tackles and four forced fumbles. Austin Pelletier, Messalonskee senior running back: One of the state’s most prolific runners the past two years, Pelletier rushed for 1,441 yards and 16 touchdowns, and also played outside linebacker and safety, earning Pine Tree Conference Player of the Year honors. As a junior he rushed for 1,370 yards and 24 touchdowns. Cam Barnes, Skowhegan senior wide receiver: Barnes was the top receiver on the state’s most prolific passing team, with 58 catches for 969 yards and 12 touchdowns. He combined with Jon Bell (45 catches, 870 yards) as a tandem that could beat defenses deep or turn quick passes into long gains. Zack Sullivan, Kennebunk junior wide receiver: At 6-foot-1, Sullivan used leaping ability, good hands and uncanny field awareness to routinely produce highlight catches, particularly on sideline routes. He had 38 catches for 599 yards (15.8 yards per catch) with four touchdowns. He also returned punts and was the Rams’ top cornerback. Zach Klein, Bonny Eagle senior offensive lineman: At 6-foot-1, 245 pounds, Klein was strong and physical on both sides of the ball for one of the top teams in the state. He was named the Gerry Raymond Award winner as the best lineman in Class A South. Sean McCormack-Kuhman, Wells senior offensive lineman: A returning starter at center, the 6-foot-1, 217-pounder was the “best offensive lineman we have ever coached. He just dominated the line of scrimmage,” said longtime Wells coach Tim Roche. McCormack-Kuhman also starred at linebacker. Garrett Lynn, Thornton Academy senior offensive lineman: The 6-foot-5, 255-pound captain was a two-way standout as an offensive tackle (first-team Class A South) and defensive lineman (second team), and is being recruited by Maine and New Hampshire, among other schools. Anthony Griffin, Scarborough senior offensive lineman: Another two-way standout, the 6-foot-7, 250-pound tackle/defensive end was good in pass protection and as a drive blocker, with the athletic ability to block downfield. On defense he made 58 tackles, 11 for loss, with 2.5 sacks. Jack Bryant, Falmouth senior utility: A three-year starter at quarterback, Bryant also became a durable running threat, started at safety and was a strong candidate for Player of the Year honors. He completed 86 of 164 passes for 1,509 yards and 17 touchdowns, and carried the ball 171 times for 1,036 yards and 18 scores. Zebulun Leavitt, Cheverus senior defensive lineman: The unanimous Class A North lineman of the year, the 6-foot-6, 285-pound two-way starter made 34 tackles, with six for loss, despite teams consistently running away from his side. Griffin Aube, Falmouth senior defensive lineman: A rangy athlete at defensive end, Aube posted 14 quarterback sacks and had the speed to routinely run down ball carriers from behind while making 63 tackles. He also handled punting duties and caught 25 passes for 313 yards. Arlo Pike, Bonny Eagle senior defensive lineman: He was UMaine’s top in-state recruit before opting to play baseball in college, according to Scots Coach Kevin Cooper. An all-SMAA defensive tackle, he was second on the team in sacks and caught nine passes for five touchdowns as a tight end. Ryan Weare, Cape Elizabeth senior linebacker: Weare drew consideration for Player of the Year as the focal point on both sides of the ball for the Class C South champs. He made 92 tackles as an inside linebacker, played on all special teams, and gained 1,332 yards with 16 TDs as a power running back. Cam Houde, Thornton Academy senior linebacker: A two-time SMAA first-team pick at linebacker, Houde had the ability to read, react and finish plays with authority. He made 108 tackles (64 solo) and had two sacks. He scored six touchdowns on just 18 carries as a short-yardage back. Sean Whalen, Madison senior linebacker: A very fast player, he made 47 tackles, forced two fumbles and returned his only interception for a touchdown. He also totaled 2,069 all-purpose yards with 25 touchdowns – 1,011 yards and 18 TDs rushing; 470 yards and four TDs receiving; and 588 yards and three TDs on returns. Kyle Glidden, Marshwood senior defensive back: Glidden led the Hawks’ secondary in tackles, had three interceptions, rushed for 854 yards and six touchdowns, caught 21 passes for 348 yards and three TDs, was 2-of-2 passing with a touchdown (in the championship game) and averaged 13.2 yards on 20 punt returns. Tanner Bernier, Windham senior defensive back: Also the Eagles’ quarterback, Bernier controlled the middle of the field at strong safety. He made more than 50 tackles (3.5 for loss), forced five fumbles and had an interception. He threw six touchdown passes, rushed for 610 yards and seven touchdowns, and returned punts and kicks. Adam Bertrand, MCI senior defensive back: Shifted to strong safety early in the season, Bertrand made more than 100 tackles with two sacks. Four of his six interceptions came in the sixth-seeded Huskies’ playoff run to the Class C title. He also rushed for 1,250 yards and scored 18 offensive touchdowns. Cody Dudley, Scarborough senior defensive back: A versatile player, Dudley made 44 tackles, with 8.5 for loss and two sacks – to go with two interceptions. On offense he averaged more than 10 yards per carry (378 yards, 8 TDs) and more than 20 yards per catch (11 catches, 229 yards, 3 TDs). Max Horton, Marshwood senior utility: As a linebacker, he led the Class B champs in tackles and also recovered three fumbles. At tight end he turned his nine catches into big gains (197 yards) and three touchdowns. As a kicker he routinely boomed kickoffs deep and made 55 of 58 PATs, and all three field-goal attempts. Tom Bertrand, Maine Central Institute: The Huskies, Class D champions in 2016, were the only team in the state to move up in class and started the year 2-3 in Class C. With a freshman at quarterback, MCI made the playoffs as the sixth seed, beat No. 3 Nokomis in the quarterfinals, then avenged their regular-season losses by beating No. 2 Winslow in the semifinals, No. 1 Mt. Desert Island in the regional final and Cape Elizabeth in the state championship game.